Conversational Portuguese Volume 2 on CD continues the organized, user-friendly learning techniques introduced in our Conversational Portuguese Volume 1 Workbook. The motivated student will be rewarded with practical lessons that reinforce what has already been learned while gaining new grammar and vocabulary expertise. In an attractive, illustrated format, the Volume 2 Workbook consists of 148 pages of 37 lessons with ample practice exercises, readings to reinforce comprehension and retention, and a complete answer section. Quizzes, puzzles, and games support the lessons in a fun and engaging way. In the vocabulary lessons, nouns that name objects in space, the world, and the city are introduced. Further vocabulary lessons include nationalities and weather and assorted common words that are useful in daily living. New verbs are learned with the appropriate AR, ER, IR conjugations. The present progressive as well as the preterit tenses are presented, as are impersonal verbs, and negative and interrogative sentences. Students learn the important differences between ser and estar; other irregular verbs like fazer, dizer, ir, querer are studied, including ter and its use in idiomatic expressions. Through the readings, exercises, and self-test questions, the student reads and creates sentences, a process that takes the learning experience well beyond rote memorization. For the student who wishes to study independently, or to augment classroom studies, the Volume 2 Workbook has an accompanying audio program. The 4 CD set is the perfect way to practice pronunciation; listening to the native speaker and repeating the lessons aloud also reinforces the lessons learned in the Workbook, and it is accessible anywhere, anytime. The CDs come with a verbatim script called Read Along for those who would like a visual guide to the audio presentation. 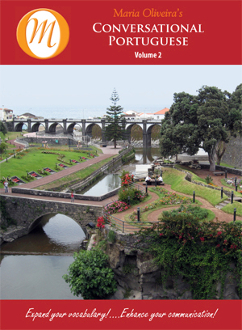 Conversational European Portuguese Volume 2 is the next level in the acquisition of the European Portuguese language; the combined Workbook and audio material assures you success in meeting the challenge.